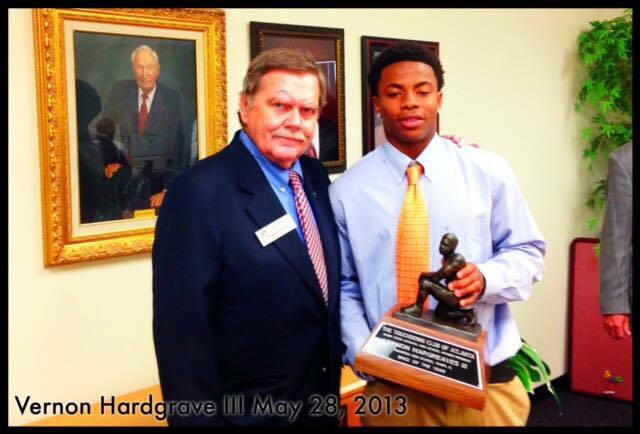 Vernon Hargreaves III, Wharton High School (Tampa, Fl), 5’10” 185 lbs. Hargreaves attended Wharton High School in Tampa, Florida, where he played football for coach David Mitchell. As a senior in 2012, he had 110 tackles and five interceptions. He was recognized as the most valuable player (MVP) of the 2013 Under Armour All-America Game. ESPN Hargreaves ranked #3 on their ESPN 300 list and the number one rated corner-back in the nation. Rivals ranked him as a five star recruit and the best player in the state of Florida. USA Today gave him the All-America honors. He took his considerable talents to the University of Florida. Hargreaves also competed in track & field at Wharton. As a senior in 2012, he posted a personal-best time of 22.56 seconds in the 200-meter dash at the Hillsborough County National Division. At the FHSAA District Meet, he placed fourth in the 100-meter dash (11.10 s), second in the long jump (22 ft 3 1⁄2 in or 6.79 m) and twelfth in the high jump (5 ft 10 in or 1.78 m).